Studying for exams and assessments can be stressful at the best of times. Having a quiet, distraction-free environment can assist students in retaining information and learning quickly. Where do you like to study? What have you found to be the best sort of study environment? Also at a few student friendly cafes. Like Three Beans at Westfield Sydney. Library is more ideal. Depending on my mood, I either like to study at home or at my university library at UTS. However, if I don't want to travel too far, I find my local library to be perfect for study too. 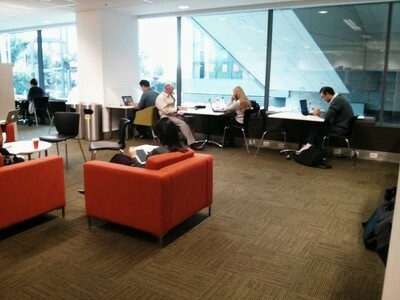 Top Ryde library is my favourite place for study, being quiet, spacious and has many excellent resources. If you are currently going through your hsc, local libraries will usually have a collection of workbooks which you can use to help yourself study. Some libraries also have free WiFi and power points for charging laptops. This is another reason why I value Top Ryde library as a study site so much. I guess when it comes to studying, you just have to factor in how much time it will take to travel, whether it might be more convenient to study at home, the cost of food for breaks and so on. For this reason, favourite study sites may significantly differ from person to person. Chatswood Library is a great one, because there are so many desks and chairs there you'll always get a spot, and it's nice and quiet. I know a number of students choose it as their study destination. I either study at the University of Western Sydney's library, which is the school I attend, or the State Library, which is where most of my friends and peers go to study.